The clichés are too obvious to resist. 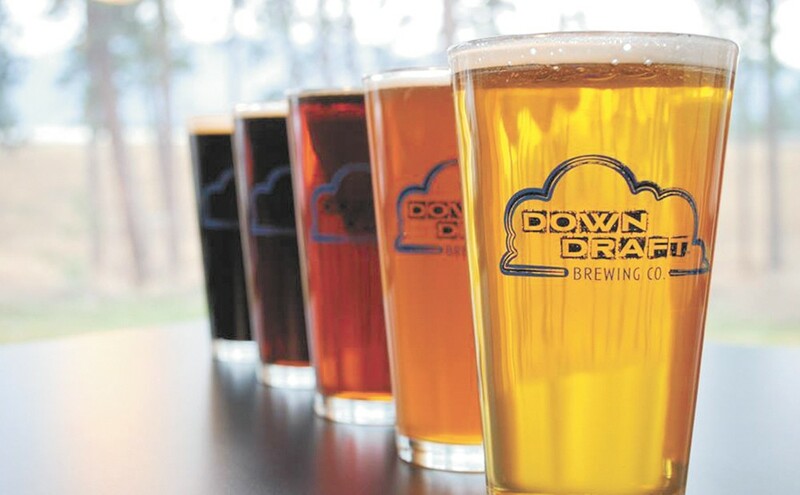 After more than a year's delay, Downdraft Brewery's founding members have "weathered the storm." And when a suitable Spokane Valley location couldn't be found, they discovered a "silver lining" in Post Falls, Idaho. "The city bent over backward to help us get our doors open," says Aimee Brayman, who along with her husband Nick, and friends Andrea and Nolan Garrett, own Downdraft Brewing. The name, she explains, is a reflection of the unique — and unpredictable — Pacific Northwest weather. "Downdraft was actually a name for an Amber Ale that we were developing, but the longer we looked at it, the more we loved the double entendre of 'Downdraft' as a weather-related term [a large, downward gust of wind] and 'Downdraft' with the connotation of draft beer." Their beer names are similarly witty, ranging from lightly fruity, piney Seltice SMaSH to chocolatey, malty Exit 5 Brown Ale, both roadway references. Dry-hopped Anonymous Amber is a nod to brain drain that can occur (such as when working two jobs). Downdraft's owners all work day jobs — Nick and the Garretts in information technology, while Aimee writes curriculum for a private school — but the brewery idea has been in the works for years. "Nick and Nolan were avid beer enthusiasts for a long time," says Aimee. The couples visited breweries and tried out home brew kits, she says. "We bottle conditioned, made lots of messes, made some good beer, made some bad beer." Even though they've barely opened, they're already planning for expansion. Additional beers are offered through the "red tap," a rotating selection of experiments, such as the currently popular Winds of Change IPA.